Yeah, it just happens to me every year about this time. . . only I never put it out in a jar. I'm worse than that--I have to keep the bag "hidden" (as if I didn't know where it was!) or else it would just happen that I would eat the entire bag within an hour or so of buying it!! Just can't help myself with those little morsels of goodness. Oh, and for me, it must be Brach's. That's what yours looks like--am I right? What's that Lay's potato chip saying..."you can't just eat one"...yeah...that's me and candy corn! I'm so glad to see this post!! Once I hit that nifty 'publish your comment' button, I'm dashing to go buy myself some of that goodness! Hmmm...sounds like someone is going around stashing candy corn in people's house. It happened here also. I guess I'll just have to eat it! I feel your pain. I have finished off 2 bags already. Thank God you can only get candy corn once a year. Have to stop myself from buying more. No judgement here, friend. I say, eat that corn! I actually DID go looking for it last weekend and all they had was the Indian corn at Hy-Vee. I was a little torked. Now I'm going to have to go get some! I love candy corn too and pinterest! Have a great day. I WISH it would just happen to me! Up north in Calgary, I haven't been able to find a big bag of candy corn. Last week when Sarah, aka Thrifty Decor Chick, shared her candy corn wreath, someone in the comments wrote that if you eat them with salted peanuts it taste like a Payday bar. I am SOO going to try that. We don't get Payday bars up North here either! 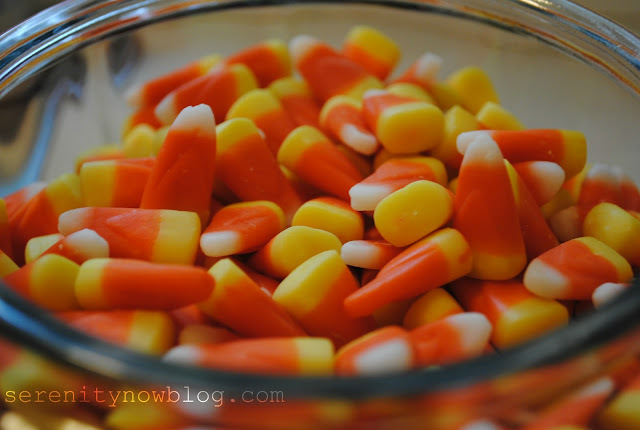 If you want to put a twist on your candy corn mix it with equal parts peanuts. It tastes like a Payday bar. Peanuts and candy corn have become a tradition in our family. My name is Wendy and I am a Candy Corn Addict! Got to admit...I can't relate to the candy corn addiction, but the Pinterest addiction 'just happened' to me too. love it! My first (because there will be more) is just ripped opened sitting on the counter. I wish it would just happen to get in my glass pumpkin, then I wouldn't be tempted to grab 10 or so every time I walk by!! oh girl! those bags ALWAYS jump into my cart every Fall. They are sneaky that way! I'm completely addicted to both too...Not sure which I love more...right now I'm willing to say Pinterest. yum!!!!! do you pop them in your mouth whole, or do you eat them by layer? it's impossible for me to not eat them layer by layer! You only ate 10 pieces? That sounds pretty good to me. I can't stay away from it if it is in the house. My husband tried to buy some last weekend and I stopped him because I KNOW that I can't resist it. It sure does look pretty in the glass pumpkin, doesn't it? Ha! This post is so funny because so far I've resisted. But I know the time will come when... IT will happen. The allure of the candy corn does not cease.